Explore, Learn, Have Fun! : The best cookies for Valentine's Day! The best cookies for Valentine's Day! Hello sweet bloggy friends! Are y'all ready for Valentine's Day? Gosh, I can't believe it is almost here! I love making these cookies all winter long. I made them for New Year's Eve, but they are perfect for Valentine's Day. How can you go wrong making rich chocolate cookies with a cherry hidden under a luscious chocolate frosting ~ delicious! : ) This recipe originally came from Ms. Jill, who was the Children's Pastor at the church I worked at from 1998- 2003. I always think of her when I make these yummy cookies! 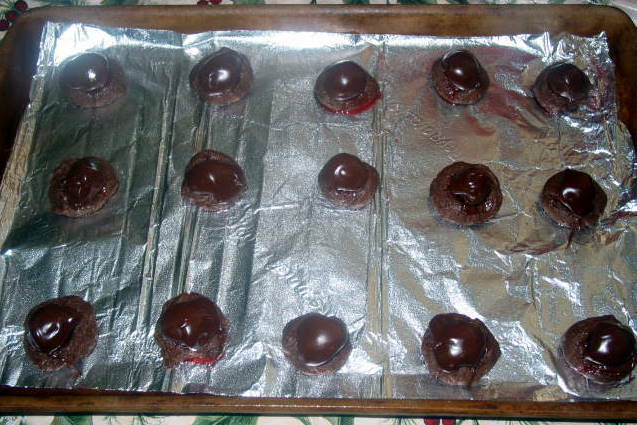 In a large bowl, combine flour, cocoa powder, salt, baking powder and soda, blend well; set aside. In a mixing bowl, beat together butter or margarine and sugar on low speed until fluffy. Add egg and vanilla; beat well. Gradually add dry ingredients to the creamed mixture; beat until smooth and well blended. Shape dough into 1-inch balls; place on ungreased baking sheet. (I used foil to line my stonewear, but I did spray it with Pam!) Press down the center of each ball with thumb. Drain Maraschino cherries well, reserving juice. 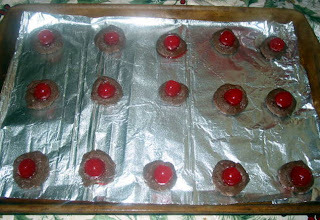 Place a cherry in the indention of each cookie. In small saucepan combine chocolate pieces and sweetened condensed milk; heat over low heat until chocolate is melted. Stir in 1 tablespoon plus 1 teaspoon of the reserved cherry juice. Spoon about 1 teaspoon of the topping over each cherry, spreading to cover cherry. If frosting seems too thick, thin with a little more cherry juice. Bake at 350° for 10 minutes, or until done. Cool on wire rack. Makes 3 to 4 dozen cookies. Thanks Heidi! 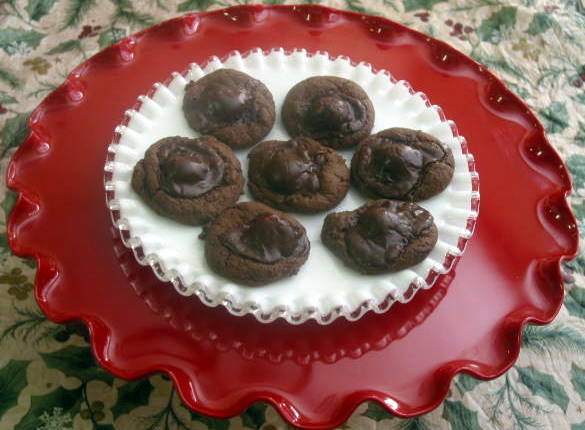 We all LOVE these cookies ~ I only make them once or twice a year, they are so tempting! These remind me of my childhood!! Please link up to Foodie Friday New follower! Thank you for taking me back and for linking up!! Thank you for the great recipes! I can't wait to try them all!